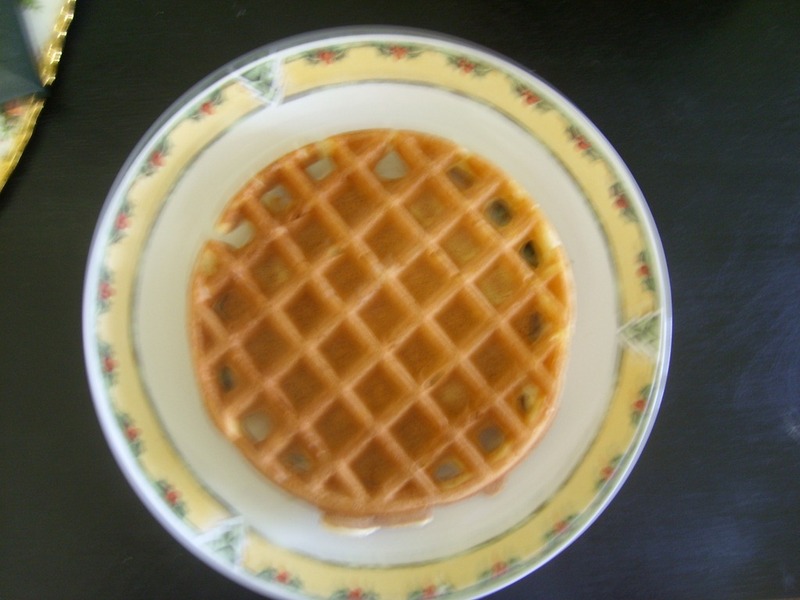 To help “celebrate” the kids back to school I made Homemade Waffles! I made them and then flash froze them so that the kids could just take them out of the freezer and pop them into the toaster oven! We have been so busy that this has made life easier for me in the morning. This was also part of my plan to cut down on my grocery bill and make my own snack food. 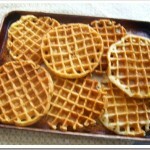 While your waffle iron is getting good and hot, stir the dry ingredients together. Separate the eggs and add 2 yolks along with the remaining dry ingredients. In a different bowl, beat the egg whites until stiff peaks form. Add oil and milk and stir. FOLD in egg whites…don’t stir but FOLD. The batter will be lumpy since you are folding in rather than stirring. It’s ok..it’s suppose to be. Oil you waffle iron (I just spray mine with cooking spray) top and bottom. That’s it! These are absolutely THE BEST waffles. Especially since I have started using Coconut Oil and Vanilla. Use them to make PBJ Sandwiches for Lunches!! Deeelish! P. S. The Coconut Oil makes these out of this world!! 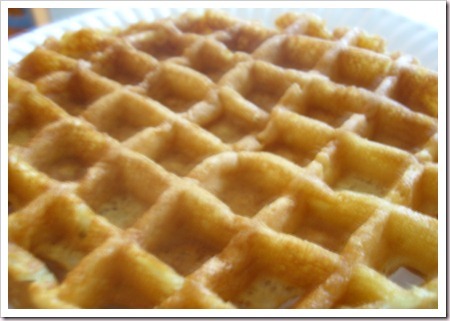 While your waffle iron is getting good and hot, stir the dry ingredients together. Separate the eggs and add 2 yolks along with the remaining dry ingredients. In a different bowl, beat the egg whites until stiff peaks form. Add oil and milk and stir. FOLD in egg whites…don’t stir but FOLD. The batter will be lumpy since you are folding in rather than stirring. It’s ok..it’s suppose to be. These look beautiful! Home made is always better than frozen! Sounds so easy thanks :O) I’m going to pin this. Those look so yummy! 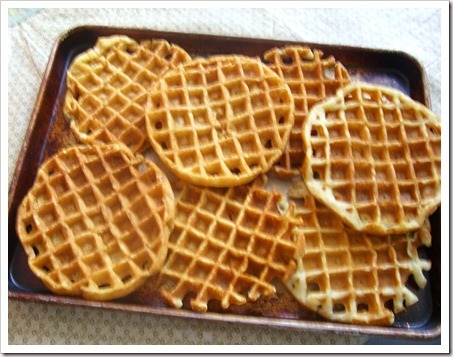 My whole family loves waffles but have never made homemade ones. I’ll have to try that soon. Hi Allyson! Yes the Coconut oil gives these the most deeelish flavor! Love it! Thanks for stopping by. Blessings! I’ve never used coconut oil before, but have heard such good things about it! Does it give the waffles a coconut flavor? Hi Pepperrific! These are soooo deelish your daughter would love them…and so would you 🙂 LOL Blessings! I have never tried cooking with coconut oil, not even sure if I can get it in our little rural area. They do look great though. Hope it was okay that I pinned this recipe. 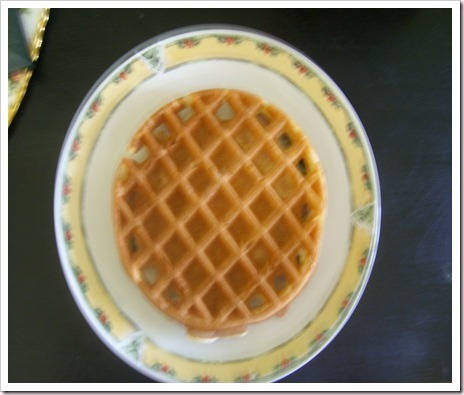 I don’t have a waffle iron but when I get one I would love to try it because my boys love waffles a lot. Thanks for sharing. And…CONGRATULATIONS and happy SITS day today. Hi Ugochi!! Thank you so much for stopping by! You are so sweet..Your boys would love these too! 🙂 Blessings to you..see over at BlogFrog! These look wonderful! Happy SITS day! Hi Deirdre! Thanks so much! They really are deelish..it would be a fun way to have the kids help too because when you “fold” in the egg whites it’s suppose to be lumpy 🙂 Thanks for stopping by! Blessings! 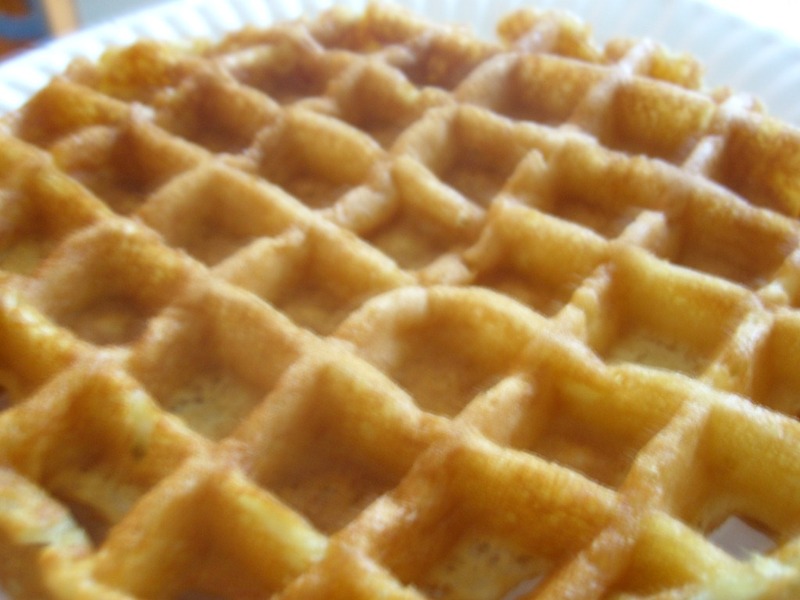 My son would eat waffles EVERY day if I let him, so I can’t wait to try your recipe. Happy SITS day today – what a great blog to feature! Awww that’s sweet Katie! 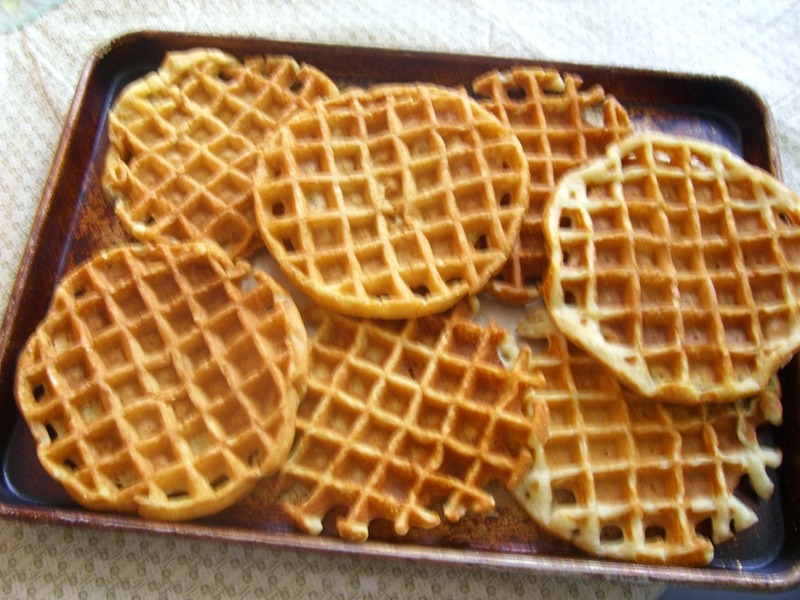 These waffles are deeelish for sure and make a huge batch so you can freeze! If you have not tried Coconut oil before you will absolutely love these with it. Unless of course you don’t like coconut 🙂 Thanks for stopping by! Blessings! Mm… those look yummy! Thanks for sharing! You welcome Jessica! Thanks for stopping by! Blessings! Ohhh! These sound tasty! If only we had a waffle iron…I wonder how they’d be fried up like pancakes? Hi Leslie! Well I’m not sure but you could cut the recipe in half and try it! I’m all for trying new things!! If you do it..let me know how it goes 🙂 Thanks for stopping by and blessings to you! They look so yummy. I don’t have a waffle iron anymore. I wish I still did. I do make pancakes and freeze them though. Pancakes are good frozen too! I just hate to spend $$ on frozen waffles and pancakes when I can make my own for so little $ 🙂 Blessings! Can you tell me how to flash freeze something. Thanks. You can do this before or after you cook something. Not with Waffles of course but with meats and things like that.